Given a large number (the “flock”) of moving physical objects, we investigate physically reasonable mechanisms of influencing their orbits in such a way that they move along a prescribed course and in a prescribed and fixed configuration (or “in formation”). Each agent is programmed to see the position and velocity of a certain number of others. This flow of information from one agent to another defines a fixed directed (loopless) graph in which the agents are represented by the vertices. This graph is called the communication graph. To be able to fly in formation, an agent tries to match the mean position and velocity of his neighbors (his direct antecedents on the communication graph) to his own. This operation defines a (directed) Laplacian on the communication graph. A linear feedback is used to ensure stability of the coherent flight patterns. We analyze in detail how the connectedness of the communication graph affects the coherence of the stable flight patterns and give a characterization of these stable flight patterns. We do the same if in addition the flight of the flock is guided by one or more leaders. Finally we use this theory to develop some applications. 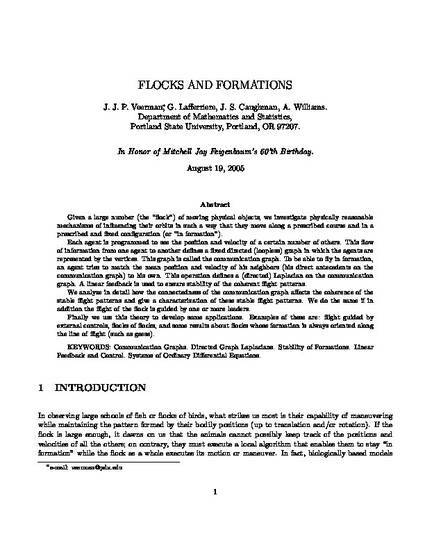 Examples of these are: flight guided by external controls, flocks of flocks, and some results about flocks whose formation is always oriented along the line of flight (such as geese). This is the author’s version of a work that was accepted for publication in Journal of Statistical Physics. Changes resulting from the publishing process, such as peer review, editing, corrections, structural formatting, and other quality control mechanisms may not be reflected in this document. Changes may have been made to this work since it was submitted for publication.